Think of a scenario where you need to pull yourself up every day to dig a well to quench your thirst. This has been the situation of NT Vaishakh when he took up jobs at Byju’s, followed by an education firm, but sooner or later left all of them for the sake of his inner calling – teaching students for Bank PO exams. While he himself could not afford to coach, he started coaching others. The concept of “sharing is learning” worked well for him and this boosted his confidence to take up Bank PO exam. Though the road he had to travel was treacherous (wherein he would just earn his bread and butter to sustain), however, walking the path of his inner calling was prime for him and the outcome of which at the end was gratifying. Though he could not crack SBI PO exam in the first attempt, it was grit, perseverance, handwork, and never giving up the spirit which made him sail through, till he could succeed. Burning the midnight’s oil, NT Vaishakh left no stone unturned to make it to the cut off of SBI PO exam in his second attempt in 2017. Finally, the celebratory day arrived when he got to know that he has secured an All India Rank of 26 in SBI PO exam. His success is not a flash in the pan, but the one which will continue to inspire the aspiring minds. In a conversation with Careers360, the Probationary Officer at the State Bank of India, RASMEC Aluva, Thiruvananthapuram Circle wears his heart on his sleeves to share what does it take to crack SBI PO examination. He also talks about the preparation strategy and the importance of mock tests and sample papers. Go through the excerpts below. Careers360: Tell us about your background and when did you qualify SBI Bank PO exam? What was your All India Rank in SBI PO exam? NT Vaishakh: I did my B.Tech in Biotechnology from VIT University, Vellore. I worked in Byju’s Classes and taught students online prior to joining SBI as a Probationary Officer on December 29, 2017. My AIR was 26. Careers360: Did you take any coaching? If yes, from where and for how long? NT Vaishakh: No, I did not take any coaching. All my training was through online videos and mock tests only. Careers360: Tell us about your current role and responsibility at SBI? NT Vaishakh: I work as an Officer under training at SBI. In this learning stage, no specific responsibility is assigned to us. We need to do pretty much everything for a brief period of time. Careers360: Which of the educational backgrounds best suit for Bank PO job? NT Vaishakh: Any educational background is fine as long as you work well under pressure. Careers360: Is coaching important for cracking the Bank PO exam? If yes, then how much and can you suggest some good coaching institutes from where one must pursue coaching? NT Vaishakh: Whether coaching is important or not depends on the candidate’s abilities. I recommend everyone to give a few mock tests (at least 15) and check their marks. Try taking a few exams without bothering about the results. Go for coaching if you see no improvement. Careers360: In case of self-study, how much is the probability of cracking the exam? What should be the preparation strategy for self-study? Learn concepts from online videos. Practice basic level questions to get a hold of shortcuts. Careers360: Can you refer some good books with Author names for all the sections of Bank PO exams? NT Vaishakh: Since most of my study was through online content, I can recommend a few good channels on YouTube. Study Smart (if you can understand Hindi), Feel Free to Learn, Study IQ are some of my usual go-to links. I have my own videos on Unacademy as well and I have pretty much covered 90% of the syllabus. Careers360: Do we need to have different strategies for prelims and mains exams? NT Vaishakh: Yes. Mains Exam is of a higher level and requires further practice and strategising. Careers360: Any online test series you suggest for bank PO exam? NT Vaishakh: PracticeMock for high-level questions, OliveBoard if you are a beginner. Careers360: Please describe a typical day at work for Bank PO. NT Vaishakh: As a PO, you are not given any responsibility. You are there to learn and train in different aspects of banking operations and business. You are expected to reach by 9:30 am and your work could stretch to 6:30-7 pm. You are expected to help out other managers in their work and also learn in the process. You get to sit in every department for a brief period and learn the nuances of the job. Careers360: What are some of the major challenges that one must be ready to take head-on when considering a career in the banking industry? NT Vaishakh: This is my personal opinion. I have always felt that Banking is a job which does not require much use of your brains and skills. Just follow procedures and you’ll do fine. Two important skills which can ensure a fruitful career in the banking industry are People Management and High-Pressure Tolerance. Careers360: How should one prepare for PO interview? What are the common points where candidates can be rejected in the interview? What should one keep in mind while appearing in the Interview? NT Vaishakh: The GD and Interview are the most crucial stage of the selection process. A candidate must be aware of current affairs and be skilled in presenting his/her views in a constructive manner. But remember that a good Mains score would greatly improve your chances of getting selected. Common reasons a candidate can be rejected can be a lack of confidence and inappropriate attitude towards work and life in general. Also, low marks in the Mains exam. It doesn’t matter what you say, but how you say it. Careers360: After which stage is the document verification done? NT Vaishakh: For SBI PO, it is during the interview stage. If you fail to present any documents for genuine reasons, you could do it later during joining. Careers360: Is there any medical test also? If yes, kindly share the medical test procedure. NT Vaishakh: For SBI PO, I had a medical test after the final results. It is a tedious process where Rs. 3000 worth of body tests are conducted, which can be reimbursed once you join. From simple body fluid tests to ECG and USG, I had to spend a whole day for this. Generally, they don’t reject candidates because of physical problems. Even colour blind, partial deafness, asthmatic and diabetic candidates are selected. But this medical record is kept with them and is referred to when he/she goes for promotions (Scale V and above). Careers360: Is there any training tenure after one is selected as a PO? If yes, kindly share the process. NT Vaishakh: A PO needs to undergo training throughout his/her career. One may get 1 or 2 trainings per year. Trainings are the most relaxed and enjoyable time of one’s career. It is the time when one can bond with other POs and develop strong relationships. For an SBI PO, one will be deputed to an SBLC (State Bank Learning Center). Food and accommodation will be provided apart from the allowances and ticket reimbursements for attending the training. I earned Rs. 18000 extra when I attended my training for 2 weeks in SBICRM, Gurugram. Careers360: What are the things one should keep in mind while filling the circle preferences in PO exam? NT Vaishakh: Choose a circle in which you are comfortable working. Many rumors go about for circle preference like branch business, work pressure etc. The scenario is the same throughout India. In case, you’re posted in a branch where there is tremendous pressure, at least he/she should feel relaxed when he/she returns from branch, where the climate and food should not cause trouble to him/her. This is one of the reasons why I opted for my home circle (and I did get it). But bear in mind that many may not be as lucky as I was. Careers360: What is the career progression after joining a bank as a Probationary Officer? 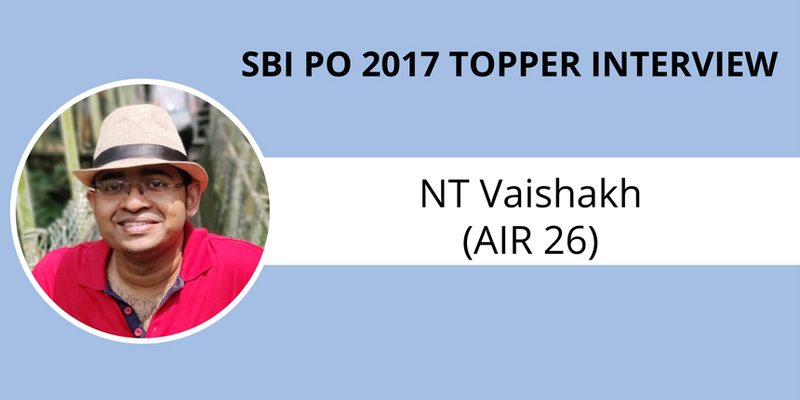 NT Vaishakh: SBI PO is a job which provides multiple avenues for a bright career. Depending on your performance, you can become a Scale II officer in 2 years (Confirmation+Promotion). You will be posted as a Branch Manager and subsequently go up to Scale V i.e. AGM (Asst. General Manager) in around 12 years. With the fast track promotions introduced, one can become a Chairman in 25 years of service. Apart from this, one can become a JIBO (generally after Scale II) and get posted in a foreign branch for a period of 3 years.